This year's Festival Supreme lineup was announced today, and it is just as amazing as always! 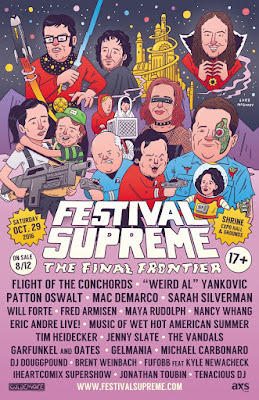 This is the 4th Annual Festival Supreme, presented to us from Jack Black and Kyle Glass of Tenacious D. The festival returns to the Shrine Expo Hall & Grounds, October 29th in Los Angeles. This years shows features so many great acts including: Flight of the Conchords, "Weird Al" Yankovic, Patton Oswalt, Sarah Silverman, Will Forte, Fred Armisen, and so many more! Hurry and get your tickets before they're gone.